Questions authority. Hangs out with a big crowd of peers. Never denies any claim made about him, no matter how outrageous. Assemble the various qualities of Christianity’s Messiah, and he starts to sound like…a high school student. 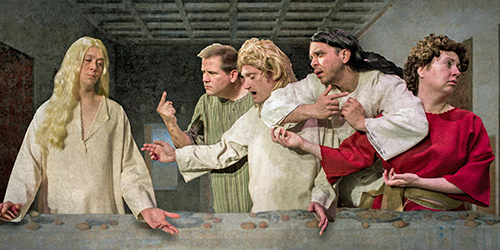 Planet Ant Theatre has taken the comparison and run with it in “Fast Times at Nazareth High,” an original comedy purportedly based on the diaries of a young Jesus. Written by director Mike McGettigan and his cast of five, this eminently smart and crafty interpretation is funny on so many levels that it will take the rest of this review to explain them all. Have you ever heard, read or been party to a reference to the New Testament? If the answer is yes (and, given the extent of its influence on Western culture and language, it probably is), get ready to marvel at just how much of it is cleverly deployed and folded into this story. When a young Jesus Josephson (Sean McGettigan) moves back to Nazareth for senior year, he wants to fit in like any normal kid, but along the way, he makes waves with his common sense and decency, inspires friendships and rivalries, and even learns a thing or two about himself. The hokey coming-of-age tale is freshened by the use of the ancient setting and language (including the delightful Bedrock simplicity of Ryan Fisher’s scenic design), patterning Biblical parables, characters, laws and proverbs onto high school tropes. From the school supplies to the extracurricular activities to the short shrift given to women, no stone is left unturned. It’s this same attention to detail that allows the show’s few anachronistic tangents to effectively surprise and fully shine. But beyond reimagining the sprawling world of the Bible as the insular world of Nazareth High, the writing also tackles story origins themselves, using unassuming interactions and liberal misinterpretation to brilliantly suggest how a simple social transaction can quickly balloon into legend. For this purpose, Sean McGettigan delivers a superb performance: Not assertive enough to deflect the celebrity that grows around him, his character is steadfast but a little rebellious, yet docile enough to reconcile him with the benevolent savior taught in Sunday school. It’s easy to see how this Jesus walks into his own mythology without realizing it; the connections are all the viewer’s to make and appreciate. Why stop there? If you noticed that the show’s title is a play on a 1982 film that spawned a generation of distinctive coming-of-age movies, so did Mike McGettigan and company. Pre-show songs (by sound/music designer Mikey Brown) pinpoint the throwback era, but even the archaic melodies covering the transitions reward careful attention. Moreover, the production’s second act is driven by a conflict straight out of the ’80s Movie Plot Contrivance Machine – the goal is always to get the girl, which requires being crowned king of the big dance, which in turn requires winning the big sporting match, DUH. Of course, getting there comes with a veritable who’s-who of high school: the coveted, misunderstood love interest (Lauren Bickers), her richie-rich jock jerk boyfriend (Mikey Brown), the principal with a weird vendetta (Shawn Handlon), and the defensive, plot-driving turncoat (Michael Hovitch). Character-wise, though, this is just the tip of the iceberg. Bickers, Brown, Handlon, and Hovitch all take on multiple roles, distinguished by costumer Kirstin L. Bianchi in a cavalcade of fake hair and cliquey robes. These Biblically rooted instructors, administrators and fellow students are exceptional across the board. Among them, Brown delivers a contemptible, petulant dunce worthy of a name like “Trevorus.” A frequent whipping boy, Hovitch shines in a wordless performance as a literal idiot. Bickers’s turn as the classic drunk bad dad is a masterpiece of derisive ineptitude. Finally, Handlon fires on all cylinders, infusing his infatuated John and loner scribe Luke and crusty instructor Noah with heightened tics and timing that maximize their humor. By no means is “Fast Times at Nazareth High” a reverential undertaking. Yet at the same time, one would be hard-pressed to find this version specifically blasphemous or offensive; the source material is impressively intact, just presented in a different light. This genre-tinted take on an origin story mines its comedy from smart references, sharp writing, and side-splitting performances, promising an abundance of laughter for viewers of any faith.